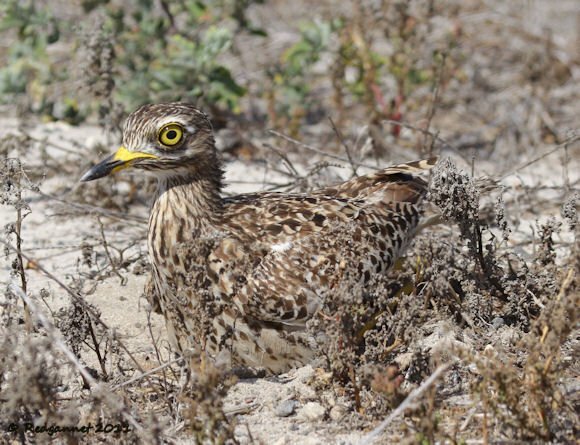 The Burhinidae family of Thick-knees (also known as Stone-curlews or Dikkops) consists of 9 species in 2 genera, Burhinus and Esacus. They are cryptically plumaged birds whose camouflage helps them to blend in with their often arid environments. In southern Africa, there are two species. 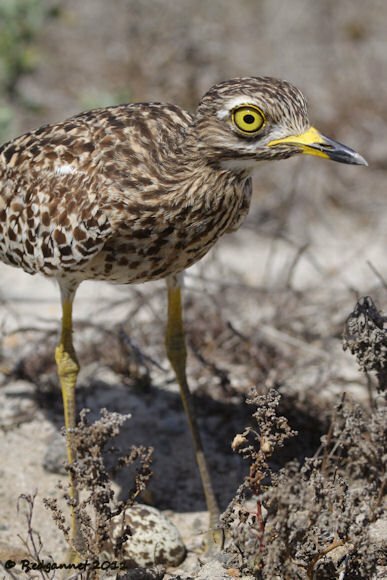 The Water Thick-knee’s, Burhinus vermiculatus, preference for moist areas may contribute to the eroneous habit of considering them amongst the wading birds. 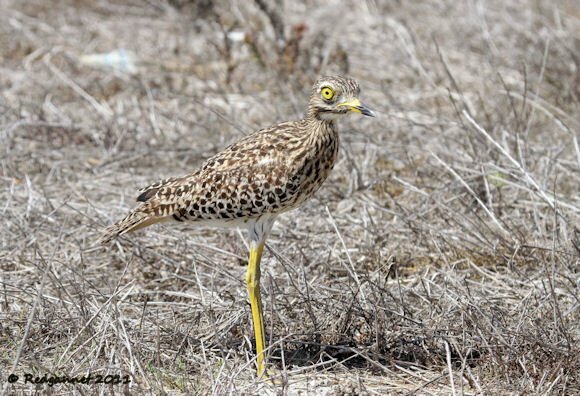 The Spotted Thick-knee, Burhinus capensisis, is found across much of Africa, favouring open country and is perfectly suited to the dry sandy ground of the cape region, where this individual would almost certainly have been overlooked were it not for its bright yellow legs, eyes and bill. It was standing perfectly still beside the sandy track when I first saw it. As I watched, it slowly moved into a patch of dried vegetation and I noticed that it was settling over a single egg. Outside of the tropics, nesting would usually take place in the spring (in the southern hemisphere, spring and the height of the breeding season occurs before Christmas); these pictures were taken in March as the weather in Cape Town is beginning to cool. A monogamous pair will select a nesting site together with the male getting the casting vote. The female prepares the site by scraping a clear spot on the ground. Two or three eggs may be laid and either bird may incubate. Sexes are alike, but I think (for no good reason), that this is the male. During the day, thick-knees will often be seen standing singly or in pairs. They are most active at night and make eerie nocturnal calls which have cemented their place in many folklore tales from Africa to Australia. If you liked this post, why not explore the gallery section at 10,000 Clicks? A multi-part trip report from Cape Town can be found at Redgannet, March 2011. This post has been submitted to Bird Photography Weekly #134. Go check it out! I’ve often thought these birds have taken one on the chin when it comes to names. 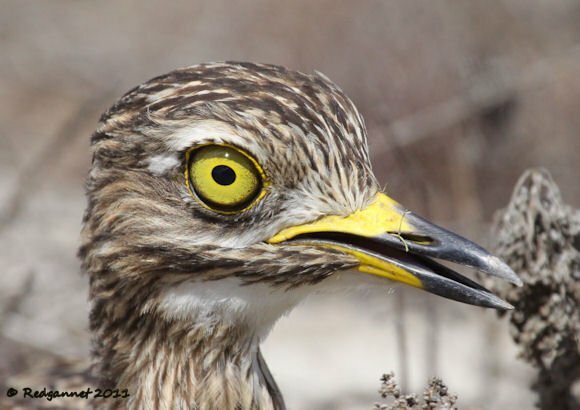 Thick-knees, dikkop, stone curlew, the names are either unflattering or just plain dull. 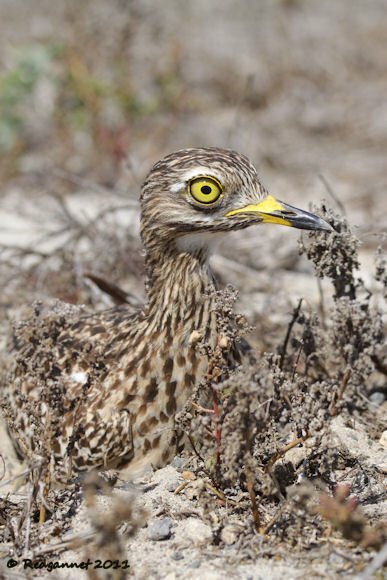 Why not call them big-eyes or night-plovers? I vote for night-plover. That eerie call is its most distinctive feature. And it is too big a bird to just obsess about its KNEES?! @Duncan: Night-plover would be awesome. @Corey; thanks it was almost worth getting stuck in the sand for. If I had made it through, I wouldn’ have seen him at all. The male gets the deciding vote on where to nest? How do we know this? (Feeling lazy, or I would do the research myself.) I too am fascinated by the name of this species. And, I too think the photos are awesome. @ Duncan;as if the poor bird did not have enough identity troubles, you suggest even more names. It’s not even his knees that are thick! The joint in question is actually his ankle. Incredible post, Redgannet. I’d be willing to get stuck in some sand for looks like these. This comments thread is rather informative as well! Awesome photos Redgannet! I don’t understand why a bird with such excellently camouflaged plumage has such brightly colored eyes, beak and legs? Any clue? Awesome photos of a beautiful bird! Beautiful shots, especially the close ups. Boom & Gary of the Vermilon River, Canada. Thank you for a very informative post. What a bird and stunning shots. Bravo! I am around to learn more. AN excellent series and how COOL to see the egg–chicks will soon be in the picture! Awesome images of a species that looks somewhat prehistoric. I look forward to tracking down a Stone Curlew later this year but the view will undoubtedly be distant but still worthwhile. A stunning bird, with such beautiful eyes. Thanks for all your comments, you are too kind. @ Sondra, I wish that I could be there for the hatching and to see the chicks, but my visits are always too brief to follow up. They will just have to get on without us. @ Larry, yellow is a common theme in this family and it seems to work for them. But why go to the trouble of hiding and then hanging up a big yellow flag beats me. I wonder if predators see some colours better than others. Do I recall seeing somewhere that predators sacrifice rods for cones or vice versa? Sharpness of vision is of more benefit to a predator and they are prepared to sacrifice colour vision to attain it. What a preposterous looking bird! This guy is so well camouflaged I am amazed you spotted it in the first place. Your photography is exquisite. Thank you for sharing your wonderful capture! Wonderful photos of this amazing bird! Interesting bird, fabulous shots, Redgannet! I looked up its song on xeno-canto.org. I can imagine how those calls spook people at night. I have a pair of these birds that have nested in my yard for 4 consecutive years, besides the numerous cats in the area, they are left pretty much on their own and seem quite happy. I live close to a ravine in Weltevreden Park in Johannesburg, and everyone is so surprised to hear that they chose my yard instead of the ravine. I have heard the adult birds talking in soft baby tones at night for a couple of weeks now, but only saw the 2 chicks for the first time last night when I pulled into my driveway. The mother or father spread their wings as wide as possible while the chicks dashed off to safety… very cute. My wife and I (retired) had a truly wonderful experience at the end of 2011 when our cat brought in a newly hatched Dikkop. We raised this little fella to a young adult. I had to put Pro-Nutro on my tongue and and lift his beak in order to get him to eat he was so young. He lived with us for eight weeks and six days and had the run of the garden at night. We knew he would leave once he could fly and a week after he finally got off the ground he was gone. This is what we wanted but it made us very sad! He became very special over those few weeks. He wasn’t allowed in the house but every now and then we would hear a “piep, piep, peep” and we’d know he was inside calling us. He actually didn’t like to be alone and even made friends with the cat who would sit with him for hours. A very special experience!! The best is he has been back to visit three times but always kept his distance. I have some beautiful photos – how do I put them on your website? @mervyn van rooyen , We have found two dikkop eggs on the shore of a river that was about to flood. With no sign of a close by parent we decided to save them. They were already about to hatch, and the one actually just did. Please help! What should I feed it. Where should I keep it at day time, and where at night? Does it drink water? Please help!! It would be appreciated. Looks like you have the same situation I had. With patience you will be able to get him (?) to eat off your tongue. Put a bit of Pro Nutro on your tongue and lift his beak with you tongue repeatedly. Eventually you feel a minute vibration which tell you he has tasted it and is taking some in. Feed him like that a few times and then you’ll find he will take it from a teaspoon. They get going with this eating process pretty quickly. Then feed him a bit of boiled egg which he will really like. It won’t be more than a week or two and you can try bone meal from the butcher and Meal Worms from the pet shop. Although they’re not reputed to drink water the one we had used to take a few sips from the water we provided. Good luck and keep us informed! Thanks for the great pics, Redgannet! We live in a village called Kleinmond in the Western Cape, South Africa (about an hour east of Cape Town) and have dikkops nesting in the gravel under the house every year. The parents share nest duty and and when the tiny fluff-balls hatch the whole family is on the move to different parts of the garden within hours for safety We spend hours watching them – they are so endearing and comical! Unfortunately 1 of the chicks is usually lost to a predator within 3 weeks which is so sad, but another 2 eggs are laid within a few weeks.